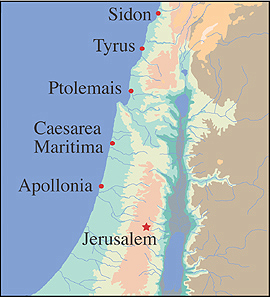 If Pliny the Elder [Natural History XXXVI.192] were to be believed, the invention of glass occurred on the Palestinian coast. He claimed that as natron merchants were sailing from Egypt, they brought their ships to shore at the mouth of the Belus River near Ptolemais. Lacking stones, they used some of their cargo to hold up their cooking pots. The heat from the fire caused the mixture of soda-rich natron and sand to fuse into glass. Creative as this story sounds, however, the heat from a cooking fire would never reach the desired temperature for full fusion of glass. We now believe the invention of glass occurred around 2200 B.C. in northwestern Iran. Chemistry for the coloration of glass was already in place during the reign of Tutankhamun in Egypt (circa 1330 B.C. ), and colored glass was heavily exploited for furniture and architectural inlay for several centuries thereafter. Although the Romans had nothing to do with the invention of glass, during the first century A.D. they did play a primary role in the industrialization of the glassmaking process in the Mediterranean world.